toria wrote: To grind the dried shrimp in some recipes...I do not have a coffee or spice grinder. Can you use a mini cuisinart or a bullet type chopper? Either would probably work to chop them but I'm not sure you would get the 'fluff' texture. Honestly, sometimes I just chop them fine with a knife. 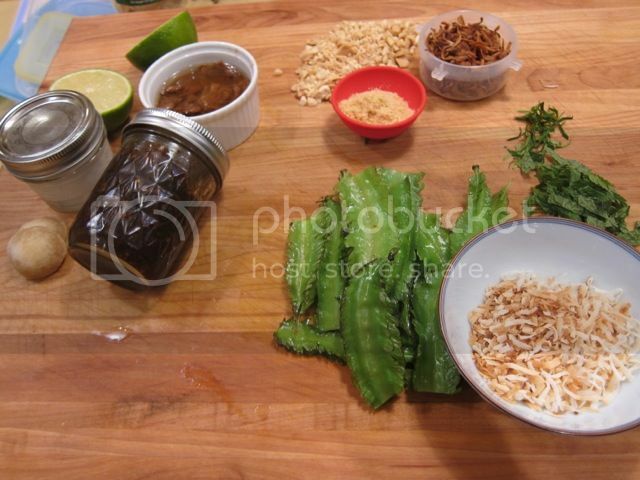 Could you post the general recipe you follow for your larb if there is one? It looks delicious and I am always on the look out for quick weeknight meals. thaiobscessed--have you anywhere given a rough recipe for the proportions of your cocoanut milk etc. dressing? I looked for it, but might have missed it. It sounds like one of those all-purpose tools that would be excellent to get familiar with producing. 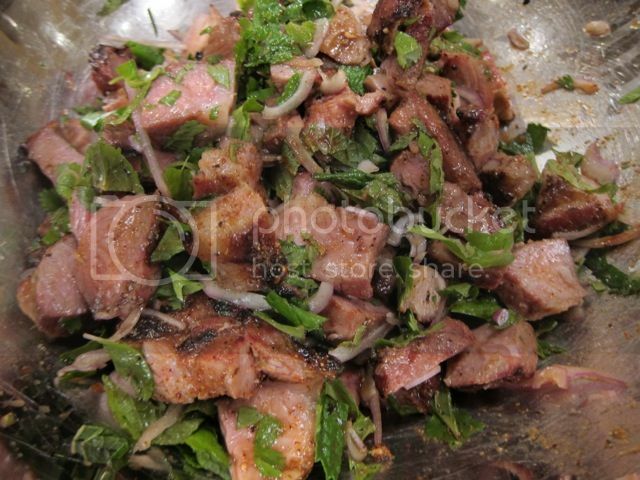 Abraus wrote: Could you post the general recipe you follow for your larb if there is one? 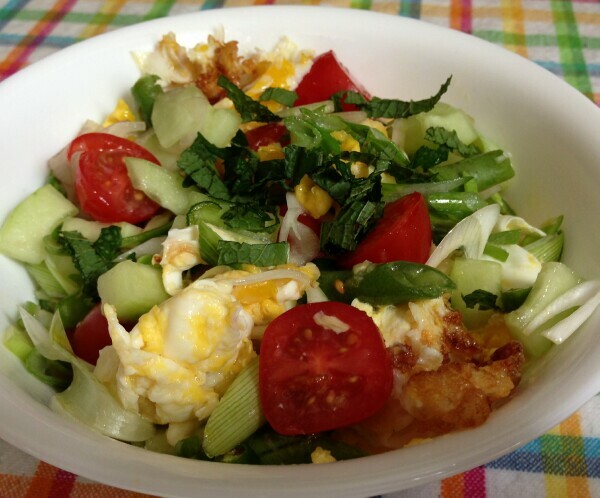 It looks delicious and I am always on the look out for quick weeknight meals. Stir-fry chicken and garlic until just done, toss with remaining salad ingredients and toss with dressing, top with chile powder and rice powder. Geo wrote: thaiobscessed--have you anywhere given a rough recipe for the proportions of your cocoanut milk etc. dressing? I looked for it, but might have missed it. It sounds like one of those all-purpose tools that would be excellent to get familiar with producing. Simmer all the ingredients (except lime juice--I like to add at the end) to thicken a little, then let cool. Last edited by thaiobsessed on April 24th, 2012, 3:11 pm, edited 1 time in total. 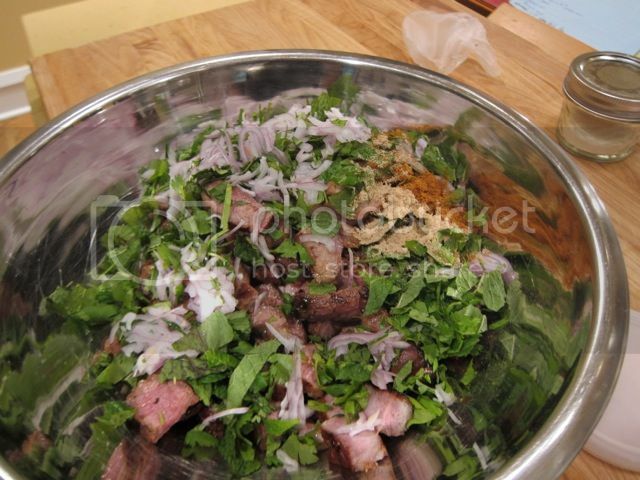 I forgot to add about I T chopped or very thinly sliced lemongrass to the larb (above). I'll edit the original. They had some nice wing beans at Golden Pacific last week. Wing beans don't seem to have much shelf life--they wilt really quickly--so I generally try and snap them up when I see them in good condition. stevez wrote: That looks delicious! Agreed. I was thinking the exact same thing. Looks amazing, thaiobsessed. Could you please elaborate on the powders? Bill/SFNM wrote: Looks amazing, thaiobsessed. Could you please elaborate on the powders? I generally use fresh galangal in Thai recipes. 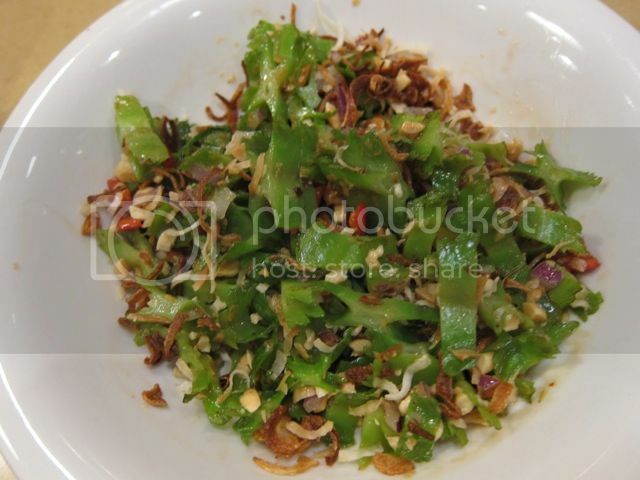 However,Kasma Loha-Unchit recommends using toasted, ground dried galangal for northern style larb to give the salad a smokey flavor and I've started using it for other salads as well. I toast pieces of dried galangal, then ground them in a coffee/spice grinder (same procedure for the chiles). For the rice powder, I toast sticky rice until it's 'golden brown', then grind in the coffee grinder as well--I really like the textural contribution of the rice powder (though my SO is not a fan). Here are some pics before mixing of the salad referenced above showing the powders. If I'm in a hurry, I'll use one of the Lobo larb seasoning packets (which has the powders plus a few other seasonings, including MSG--doesn't bother me but I know it bothers some). JoelF wrote: I've been working on a "ghetto" banana blossom salad recipe, using Durkee Fried Onions and canned artichokes, rather than actual banana blossom and crisp-fried shallots. Haven't had the nerve to actually foist it on anyone yet, but the ideas are stirring. The labor saving is attractive, but would it actually work? Banana blossom and artichoke have similar textures, although you'd have to do a fair amount of rinsing to get the brininess out of the chokes. Have you considered using frozen artichokes, which generally aren't brined? The only frozen chokes I've seen (but i haven't looked much) were artichoke heart bottom cups -- great for stuffing -- seen at Arax Foods in Niles. If it doesn't include the bracts (the leafy parts), it wouldn't have the texture similar to banana blossom, and those certainly didn't. Frozen artichoke bottoms are almost always available at Marketplace on Oakton. But I would forget about those and use hearts of palm, which to me are a better substitute without textural issues. Gorgeous Gary, simply gorgeous! And isn't She Simmers great? 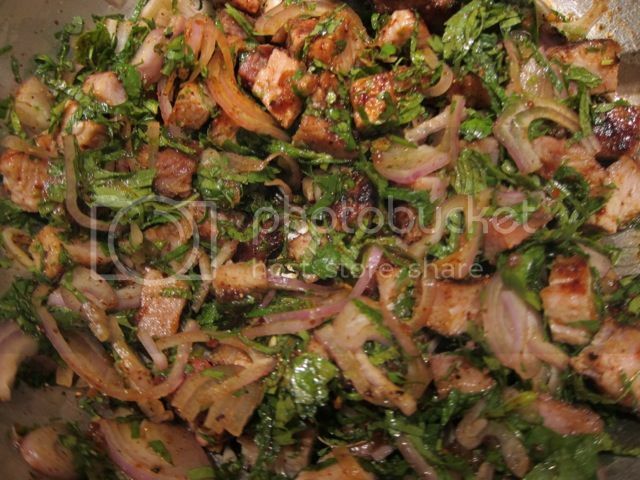 Made chicken Laab based on She Simmers Laab Gai. 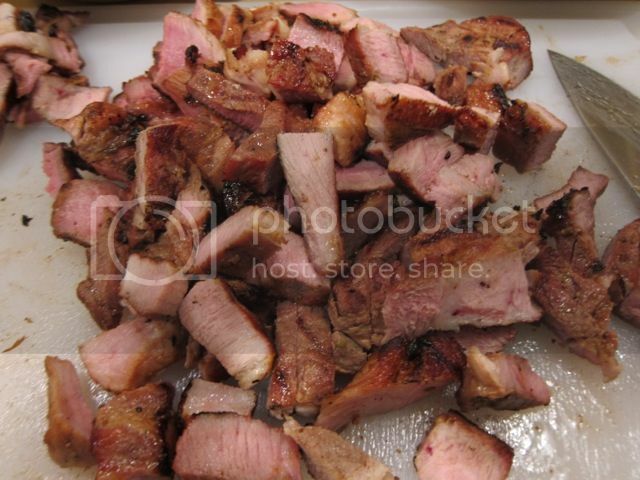 Tasty, went perfect with sticky rice, said commander obvious, and was simple to make. One important note, though I've made/used toasted rice powder/Khao Khua quite a few times, this is the first time I used Thai sticky/sweet/glutinous rice, in other words the correct rice for making toasted rice powder. Toasted ground Thai (raw) sticky rice grinds to a finer powder with no coarse bits, incorporates better and lends a more pleasing texture and taste.